"I am a poor student," I explained to my friend. "Have you seen my car?" For at least a month, I could convince a group of people I am a poor student with this line, because I generally leave my car at home on weekdays. And since this group of friends was relatively new, they did not have a chance to hang out with me outside of school yet. That said, it did not take long until my cover was blown. A few weeks ago, we were all heading to an event, and one of them asked me for a ride. When she got in my car, seeing my car was the latest model nicely trimmed with leather on the interior, she commented, "Jonathan, you are not a poor student." To which I replied, "I know, have you tried the heated rear seats?" The thing is, while my Honda Accord is certainly not a rich man's automobile, my 9th generation Touring sedan is far from being peasant class. As ubiquitous as a Honda Accord may sound, it is a car that seems to strike a chord with very wide range of buyers: Young or old, rich or poor, male or female, you name it. The reason? Everyone wants to get more bang for their buck, and with the Honda Accord, you do not need to spend a lot to get a lot. In our report today, I would like to propose the same idea for those who are looking for a high performance, high capacity network attached storage solution. My goal is to try to strike the sweet spot in delivering a massive amount of storage, while ensuring this setup is also optimal in power efficiency, features, dependability, and performance, all without totally breaking the bank. You know, a setup that will surprise and impress your friends at the same time, just like the Honda Accord. Is this a feasible project? Will I be successful in the end? Read on to find out! There are tons of hard drives from Western Digital and Seagate you can buy for your NAS at press time. 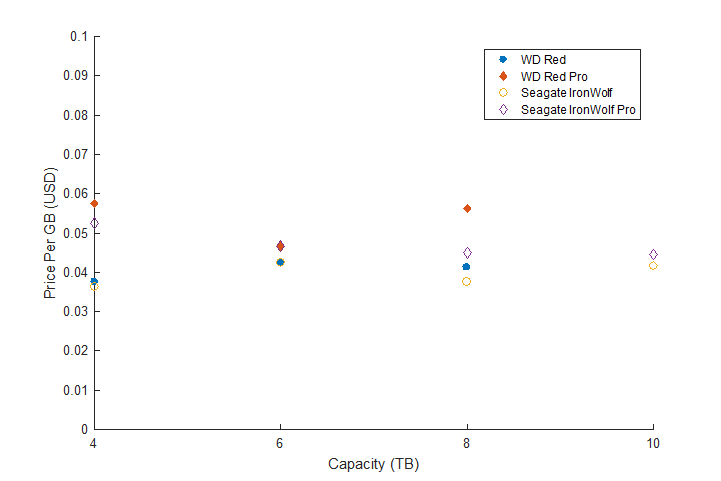 From 4TB and up, I graphed the price per gigabyte data collected at the time of writing this article for the Red and Red Pro lineup from Western Digital and IronWolf and IronWolf Pro lineup from Seagate above. As it can be seen, you can get quite a bit of bang from your buck in the 4TB range, and we have covered the Western Digital Red, Red Pro, and Seagate NAS HDD (The IronWolf 4TB is an updated version of the NAS HDD) in the past. However, since it is 2017, and we are looking for something of a higher capacity, I considered the next sweet spot segment: The 8TB class. To start, I picked up four Western Digital Red WD80EFZX 8TB hard drives. These helium filled 5,400RPM hard drives are not the cheapest per gigabyte, nor do they deliver the best performance; in fact, they are not even the largest available in the market. If you are willing to pay marginally more per gigabyte for 25% increase in capacity, the Seagate IronWolf ST10000VN0004 10TB is one of the fastest and most power efficient hard drives in the market today. If you want to spend less money, the Seagate NAS HDD ST8000VN0002 8TB (The IronWolf 8TB is an updated version of the NAS HDD) is considerably cheaper at the expense of power consumption. But since I want to strike the sweet spot in delivering a massive amount of storage, while ensuring this setup is also optimal in power efficiency, dependability, and performance without totally breaking the bank, the WD80EFZX will be my pick. The price: $1320 at press time. In my search, QNAP's latest TVS-473 fits my bill. We will do an in-depth review of this product in the coming weeks. This small business class NAS comes with an AMD RX-421BD quad core CPU and an embedded Radeon R7 graphics processor. The latest in hardware technology allows the 64-bit version of QTS 4.3 to be run, along with 4K video output and accelerated 4K H.264 video decoding and encoding. With two available M.2 PCIe slots inside, the TVS-473 is the latest in NAS technology that represents the state-of-the-art in a private LAN and cloud storage solution with top-notch multimedia features. The price: $980 for the model with 8GB RAM at press time. 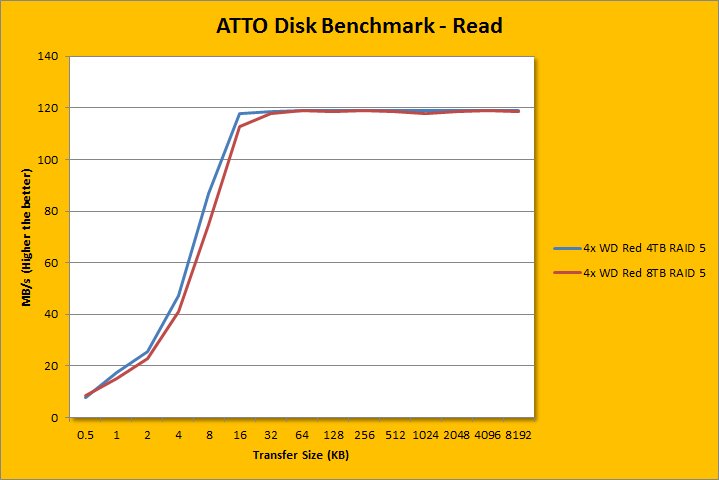 24TB of usable storage in RAID 5 configuration is pretty epic. 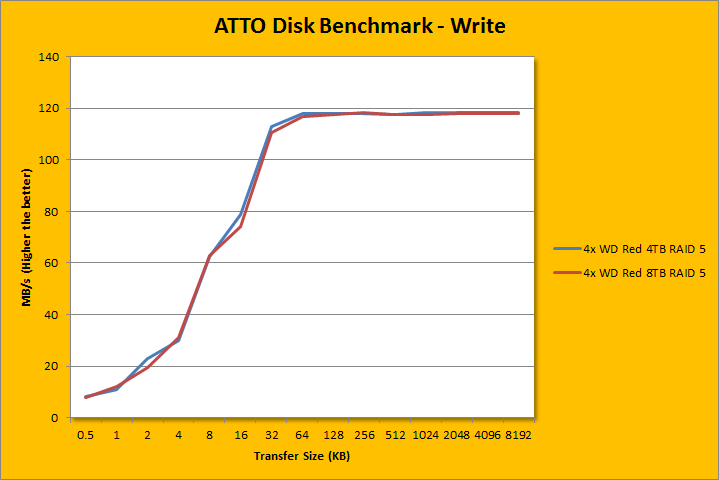 First, I tested four Western Digital Red WD80EFZX 8TB drives against four Red WD40EFRX 4TB drives, both sets in RAID 5 configuration, to see how they compare. Although the WD80EFZX is a better performing drive per our benchmarks, a slight edge was given to the WD40EFRX when deployed in our NAS when running in RAID 5, possibly due to the way the QNAP NAS controls higher capacity drives. That said, the difference was not significant at all; most of them happened during the ramp up until we became bandwidth saturated at 64K and higher. 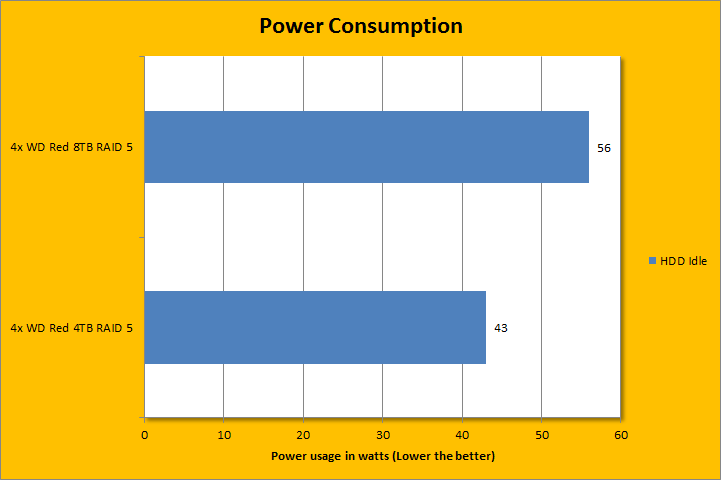 Power consumption is another big topic of concern. The QNAP TVS-473's powerful hardware under the hood made it quite a power-hungry system compared to other boxes we have tested in the past. That aside, while idling, the system configured with four 8TB drives consumed an additional 13W compared to the 4x4TB setup. However, gap lessened to only 6W while under load, thanks to the WD80EFRX's helium fill. It is important to point out the WD80EFZX is one of the most power efficient hard drives in its class per our recent tests -- so you are not going to get much better than this with regards to hard drives. You just have to pay to play for the additional capacity. "I am a poor student," I began with my favorite line, only to be interrupted by my friend. "Yes, I have seen your car. You are not a poor student." 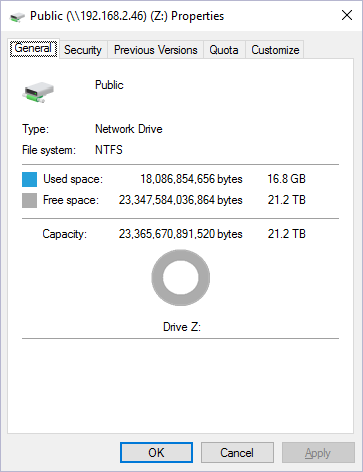 It is always nice to be able to get something that strikes a balance in all parameters without breaking the bank; in the same way I was with my car, was I also successful in the NAS world? I set out to hit the sweet spot in delivering a massive amount of storage, while ensuring this setup is also optimal in power efficiency, features, dependability, and performance. With 32TB worth of storage (24TB usable in RAID 5), I definitely got the capacity part right: Four WD Red 8TB drives is quite a bit for years to come. You can buy bigger capacity drives, but it will cost you more than $0.0413 per gigabyte. That said, if you are willing to sacrifice some power efficiency, getting the Seagate IronWolf 8TB will run you only $0.0375 per gigabyte at press time. The issue, of course, is you will become bandwidth limited in most tests -- the IronWolf will prove advantageous only if you do work that requires high IOPS. 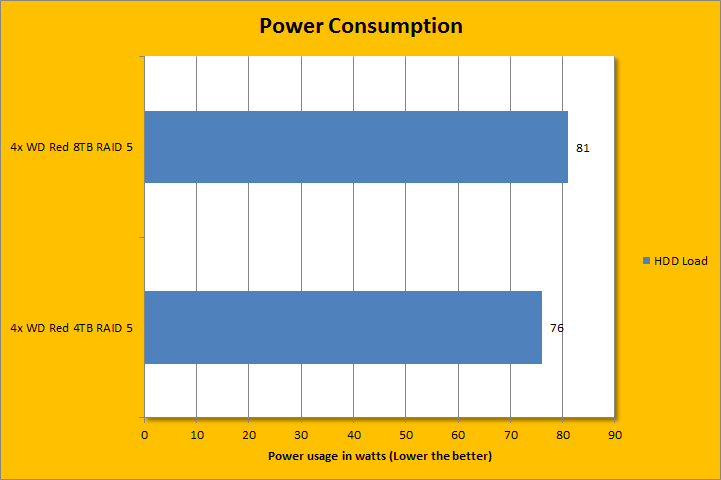 In terms of power efficiency, the WD Red 8TB is one of the best available. However, I must admit while QNAP's latest NAS is indeed loaded with tons of features with practically unmatched hardware in the SMB world, its power consumption was a little high for my liking. I probably leaned too much into features and performance on this one, haha. If you are willing to sacrifice some performance for better power efficiency, QNAP's TS-453A is also a solid performer for the money. As far as dependability is concerned, both QNAP and Western Digital has long been known as manufacturers of highly reliable hardware that are the best in the industry. I have never had a problem with either. At the end of the day, have I accomplished my mission with $2300 with this QNAP and Western Digital combination? In a general sense, even though I did become a little obsessed with features and performance with the latest and greatest at some point, I consider my project a success. QNAP and Western Digital provided the products used in this article to APH Networks to facilitate this report. Do you have any comments or questions about our NAS setup? Drop by our Forums. Registration is free, and it only takes a minute!